At WagsPark, dogs can be dogs—getting the exercise, mental stimulation, and doggie playtime they crave. That’s important, because dogs need vigorous exercise at least three times a week—the kind of aerobic exercise they can’t get from daily walks. Not only is active play healthy for dogs, but physical and mental activity can often prevent behavior issues at home. 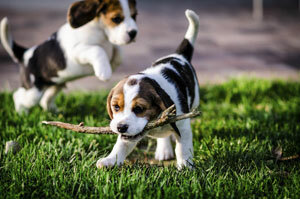 First, schedule a 10 to 15 minute temperament test to ensure that your dog will enjoy the company of other playmates. You’ll also need to provide proof of up-to-date vaccinations as well as spaying or neutering. * We enforce these high standards of admission to help protect members’ dogs and ensure that everyone enjoys a safe, relaxing time together. See our daily pricing and membership packages.